Even a few years back major manufacturers utilized standard CO2 lasers in factories for welding applications. Massive systems installed in separate rooms away from the actual production process supplied the energy for what, at the time, was relatively new laser welding technology. Developments since then have continued and modern systems increasingly use solid-state lasers, which deliver a range of major benefits. In consideration to running costs of laser welding systems, the main focus is on two components – the energy consumption of the laser and the cost of the gas, distinguished between the laser gas (laser medium) and the shielding gas for stabilizing the welding process. In addition to gas consumption, expensive gas logistics cause costs to increase. These are simply eliminated by using solid lasers such as the disk or fiber laser. Most applications on EMAG systems use compressed air as the process gas, which does not affect the quality of the weld, although it creates a thin oxide coating on its surface. The CO2 laser also cannot compete with the solid-state laser in terms of energy consumption. 56 kW of electric current is used by a CO2 laser to generate a laser capacity of 4 kW, while a solid-state laser requires just 17 kW, an energy savings of 70 percent. In addition, a solid laser requires much less cooling. Added together, a solid-state laser consumes roughly one-quarter the energy of a CO2 laser. Laser welding systems often operate with short cycle times, often just a few seconds, making a massive part throughput rate possible. Their integration into the material flow within the production process is therefore an important factor. On CO2 laser systems, the beam is guided, or in other words the laser beam is “transported” to the welding lens by mirror systems. The beam source, cooling units and machining station(s) must therefore be close together. This results in a series of drawbacks such as the complicated feed and discharge of the parts for welding which makes supplying several welding stations with the same laser source a challenge. In practice, these problems do not exist when using disk or fiber laser welding systems since the space requirement is so low that they can be easily integrated into existing production lines. The actual laser source may be up to 50 meters from the system, as the beam can be guided with relative ease thanks to the transport fibers allowing the welding stations to be perfectly integrated into the material flow. Falling costs and a better system layout are benefits, however meaningless if the quality of the weld does not match that produced by a CO2 laser. Not only is this the case, but welding speed can even be increased in many applications. This reduces both heat warping in the workpiece and the cycle time. In summary, we can say that fiber / disk laser technology is more efficient than CO2 laser technology and has a faster welding speed. 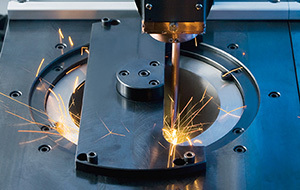 This means that disk or fiber lasers also meet current demands of component production for fuel-saving and lightweight motor vehicles in full. So far, we have only discussed the benefits of using solid lasers, but are there any drawbacks? “Actually, we cannot say that there are any drawbacks compared to the use of CO2 lasers; what we have are challenges that must be overcome,” says Dr. Mootz. “For example, the use of solid lasers makes for much greater precision than in the past. A beam position accuracy of less than 50 micrometers places heavy demands on the machine, workpiece holders and clamping devices, as well as on the focus and alignment of the laser’s lens.” EMAG ELC systems fully satisfy these demands. If, for example, the increase of weld spatter through the use of solid-state lasers is considered, perfectly tailored tools to fully cover the component are developed. For machining different components this raises the question of retooling times, for which EMAG has found a simple but efficient solution on the ELC 160. The system features a tool bridge with up to three different tool sets in addition to an integrated flue gas extractor, which allows retooling to be carried out in a matter of seconds and is ideal for the highly flexible and highly productive manufacture of gearbox parts in large volumes. We have found that there is practically no alternative to the use of solid-state lasers on production laser welding systems for the manufacture of powertrain components. Nevertheless, their use requires extensive expertise to bundle the benefits in a highly efficient laser system such as the ELC series systems from EMAG. This is a challenge that the experts in Heubach successfully master every day. LASER – Laser is an acronym for Light Amplification by Stimulated Emission of Radiation. A laser actually consists of three main components: the laser medium (for example CO2 or crystals), whose atoms and molecules are converted to a better energy state by the pump, the second main component of a laser. The third component of every laser is the resonator which ultimately ensures that the high energy photons created in the laser medium leave the material and ultimately constitutes the laser beam. Weld spatter – Weld spatter is formed by very small particles which are removed from the workpiece during the welding process and are spread over the surface. These have an adverse effect on the quality of the workpiece and should therefore be avoided wherever possible. Pumping – Pumping is the excitation of the electrons in a laser medium to a higher energy level. This is generally achieved by radiation, such as by a laser diode. Solid laser – Solid lasers are the type of laser in which the laser medium is a solid body. It may be crystal or glass to which foreign ions are supplied. See also CO2 laser. Laser diode – The laser diode is the basis of the pump in which the energy for the pump radiation is generated in the required wavelengths. Laser diodes have become established as energy sources since they achieve a much longer service life and higher efficiency levels compared to other optical media, such as an arc lamp. CO2 laser – On the CO2 laser, the laser medium is CO2 gas, similar to the solid laser. Disk laser – The disk laser is a solid laser whose resonator is a disk-shaped crystal. The pump radiation is fed through the disk multiple times to achieve maximum absorption of the energy supplied by pumping. Fiber laser – As the name suggests, the fiber laser consists of a glass fiber which acts as the laser medium. The pump energy is fed through the glass fiber to generate the laser radiation.